Throughout the early years of the 16th century hundreds of fishing vessels flocked from the western ports of England, France and Spain to Newfoundland and the Gulf of St. Lawrence. Foremost among these hardy and semi-piratical sea rovers were the mariners of St. Malo - a rugged, daring and independent breed. In the famous sea-port of Brittany, Jacques Cartier was born and brought up. We know nothing of his early years; but doubtless in such an atmosphere he took to the sea when very young. Since we learn from the register of his marriage at the age of twenty-eight that he had already reached the grade of master pilot. When the French king, Francis I, seized with the ambition of rivalling the American discoveries of Spain and England, determined to encourage the exploration of the coasts of the North Atlantic to find a passage to Asia, the command of an expedition was given to Cartier. In April, 1534, with two ships of about sixty ton each, manned by sixty men, Cartier sailed from St. Malo to the west. Thirty days later he sighted the eastern shores of Newfoundland. He coasted north to the Straits of Belle Isle, through which he passed into the Gulf of St. Lawrence. Here he spent the summer, sounding the depths of harbours, noting the conformation of the coasts, and seeking possible openings toward Asia and the Indies. He sailed down the western side of Newfoundland, crossed to the Prince Edward Island of to-day and made his way northward up the coast of New Brunswick and Quebec. Fierce gales, fogs, unknown currents, reefs and shallows made his voyage perilous; but the experienced Breton sailor met every change of wind and weather with courage and skilful seamanship. In the middle of July a furious storm from the north drove his little ships for shelter into the harbour of Gaspe, and for nine days he dared not, venture into the open gulf. Great numbers of the Indians flocked to see the strange winged, vessels, the bearded white men, and the countless other wonders that Cartier's visit brought to them. When at length the weather cleared, Cartier set up a great cross, bearing a shield with three fleurs-de-lis, the arms of France, hung from its centre, with the words, "Vive le Roy de France," carved above it, as the symbol of the Christian faith and French sovereignty. 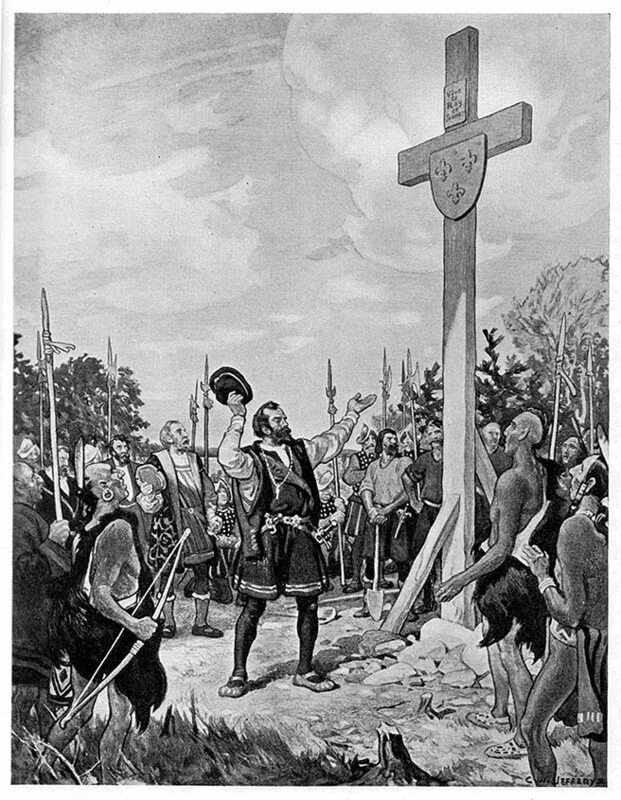 All his company saluted the cross, and Cartier proclaimed Francis king of the country, while the crowd of Indians looked on in puzzled amazement at the ceremony. Some dim foreshadowing of the fate of their race, and their subjection to the white man filled their minds, for they protested against the erection of the cross. But Cartier explained to them by signs that the cross was set up as a landmark and sign-post to the harbour, and promised that he would come back and bring them iron and other things which they desired. 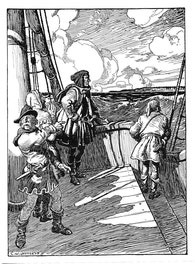 He dressed two young sons of the chief in gaily coloured shirts and ribbons, with red caps and brass chains round their necks, and invited them to sail with him to France. Willingly or unwillingly, they accompanied him, and the vessels sailed forth again. Soon, on his left, opened the mouth of the River St. Lawrence; but he supposed it to be only another great bay of the coast and kept on therefore, to the north-east. He rounded the eastern end of the island of Anticosti and then turned west up the river. As he proceeded the north shore of the mainland came in sight, "a marvellously high coast, cut up into peaks," as he describes it. Here the channel narrowed and the tides ran strong and fast. Head winds and cross currents met them, and the lumbering little ships could make no progress. Five days they laboured in vain against wind and tide. Cartier called his pilots and captains together to consult what was best to be done. They gave it as their opinion that as the tides ran so strong, and the autumn gales would soon be upon them it was impossible for the ships to go farther. Though in sight of what looked like a westward passage, no more could then be done, and Cartier, therefore, reluctantly turned homeward. On the 5th of September the vessels dropped anchor again in the harbour of St. Malo. 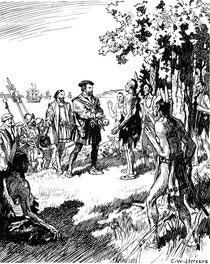 “Early Canada Historical Narratives -- JACQUES CARTIER.” Accessed July 23, 2017. http://www.uppercanadahistory.ca/finna/finna1.html.